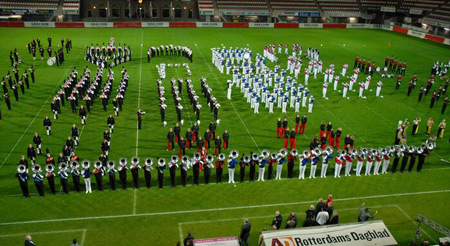 Thousands of drum corps enthusiasts enjoyed the climax of the Drum Corps Europe (DCE) Championships at Sparta Stadium on Saturday, Sept. 29 in Rotterdam, the Netherlands. Earning the 2007 DCE championship titles in three classes were Senators of Eastleigh, Hampshire, UK; DrumSpirit of Dadizele, Belgium; and Jong Jubal of Dordrecht, the Netherlands. For the first time in history, a British corps won the DCE "Open Class" title. That corps, the Senators, won the prelims competition in the afternoon and managed to maintain its lead position in the evening competition. 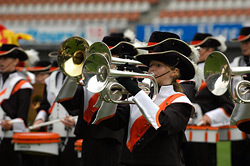 Beatrix from Hilversum, the Netherlands took the silver medal, and third place went to the 2006 DCE Champions from Dordrecht, the Netherlands, Jubal. Read more on DrumCorpsEurope.org. An Olympic style retreat concluded the 2007 DCE Championships.